Innovative and authentic, church lead is the perfect product for restoring historic buildings. 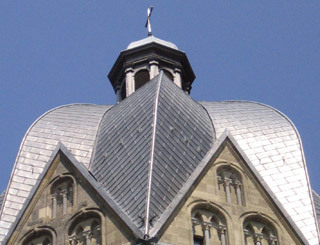 Coated on one side with tin, the lead sheet was developed specifically to meet the requirements of historic building and monument conservation and combines the advantages of both metals. Condensation, poor ventilation and the aggressive tannins in many woods often cause problems for roofs and façades on listed buildings. The patented product church lead is specially suited to such applications. The tin coating on the rear guarantees reliable protection without affecting the authentic look of the front side. Church lead thus offers extra durability within the constraints of listed building conservation. Church lead is ideal for traditional working on a building. It can be applied patinated or unpatinated to retain the unmistakable aura of the listed building even following restoration. 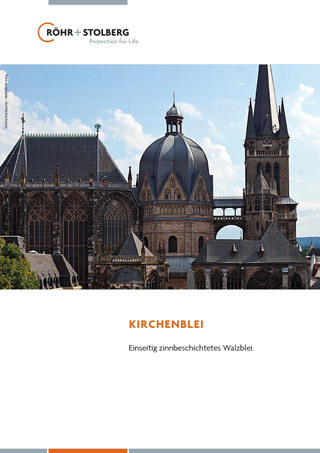 Röhr + Stolberg produces the sheets for this application in formats tailored to the customer’s specifications. Like all lead sheet products from Röhr + Stolberg, church lead is manufactured from recycled lead and is ideal for recovering. Röhr + Stolberg supplies patination oil and lead wool as complemantary products. Röhr + Stolberg manufactures the sheets to meet individual requirements and is happy to advise customers regarding the sizes and quantities required. Products can be supplied flat or rolled.